After an extensive mission among the Jewish communities of New York, London, Amsterdam, Constantinopel (present-day Istanbul) and Jerusalem, apostle Orson Hyde stayed in Germany for a while. 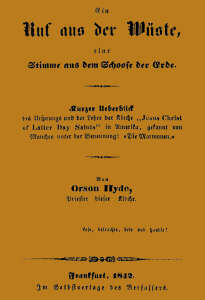 There he published the pamphlet Ein Ruf aus der Wüste (A Call from the Desert), which includes an account of the first vision in chapter one “How the Angel of the Lord Appeared to Joseph Smith Jr.” (Hyde 1842, pp. 13-17). Joseph Smith Jr., the person to whom the angel of the Lord was first sent, was born on December 23 in the year of our Lord 1805 in the town of Sharon, Windsor County, Vermont. When he was ten years old, his parents moved to Palmyra in the state of New York. For almost eleven years he lived here and in the neighboring town of Manchester. His only occupation was to plow and cultivate the soil. Because his parents were poor and had to feed a large family, his education was meager. He was able to read fairly well, but his ability to write was very limited and had only little literary knowledge. His knowledge of letters did not go any further. Most of the subjects which were generally taught in the United States of America were completely unknown to him at the time he was favored with a heavenly message. When he had reached his fifteenth year, he began to think seriously about the importance of preparing for the future; but it was very difficult for him to decide how he should go about such an important undertaking. He recognized clearly that it would be impossible for him to walk the proper path without being acquainted with it beforehand; and to base his hopes for eternal life on chance or some unknown uncertainty would have been more than he had ever been inclined to do. He discovered the world of religion working under a flood of errors which by virtue of their contradictory opinions and principles laid the foundation for the rise of such different sects and denominations whose feelings toward each other all too often were poisoned by hate, contention, resentment and anger. He felt that there was only one truth and that those who understood it correctly, all understood it in the same way. Nature had endowed him with a keen critical intellect and so he looked through the lens of reason and common sense and with pity and contempt upon those systems of religion, which were so opposed to each other and yet were all obviously based on the scriptures. After he had sufficiently convinced himself to his own satisfaction that darkness covered the earth and gross darkness the nations, the hope of ever finding a sect or denomination that was in possession of unadulterated truth left him. Consequently he began to investigate the word of God in an attitude of faith as the best way to arrive at a knowledge of the truth. He had not proceeded very far in this laudable endeavor when his eyes fell upon the following verse of St. James: “If any of you lack wisdom, let him ask of God, that giveth to all men liberally, and upbraideth not; and it shall be given him.” He considered this scripture an authorization for him to solemnly call upon his creator to present his needs before him with the certain expectation of success. And so he began to pour out to the Lord with fervent determination the earnest desires of his soul. On one occasion, he went to a small grove of trees near his father’s home and knelt down before God in solemn prayer. The adversary then made several strenuous efforts to cool his ardent soul. He filled his mind with doubts and brought to mind all manner of inappropriate images to prevent him from obtaining the object of his endeavors; but the overflowing mercy of God came to buoy him up and gave new impetus to his failing strength. However, the dark cloud soon parted and light and peace filled his frightened heart. Once again he called upon the Lord with faith and fervency of spirit. At this sacred moment, the natural world around him was excluded from his view, so that he would be open to the presentation of heavenly and spiritual things. Two glorious heavenly personages stood before him, resembling each other exactly in features and stature. They told him that his prayers had been answered and that the Lord had decided to grant him a special blessing. He was also told that he should not join any of the religious sects or denominations, because all of them erred in doctrine and none was recognized by God as his church and kingdom. He was further commanded to wait patiently until some future time, when the true doctrine of Christ and the complete truth of the gospel would be revealed to him. The vision closed and peace and calm filled his mind.